This would be fine, except there was no update available. People were being relentlessly bombarded with this alert when they opened their iPhone or pulled down their notification tray. Naturally, many of them took to the internet to complain, posting screenshots and making fun of Apple on sites like Twitter. Thankfully, Apple has fixed whatever went wrong and issued a fresh update to provide some relief to its testers. 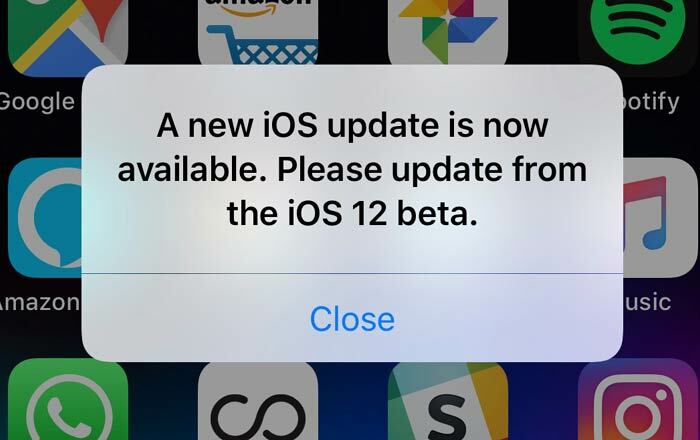 Anyone affected by the bug should immediately download the iOS 12 developer beta 12 or public beta 10, depending on which program they belong to. Feedback has been positive so far. It should get rid of the issue permanently. Cupertino just quietly resolved the problem behind-the-scenes. You’d be more likely to win a million on Betfair online or something before Apple ever publicly admits to making a mess of things, of course. It didn’t even specifically mention the bug in its iOS 12 beta 12 release notes. The iOS 12 beta 11 rolled out earlier this week and appeared fine on the surface, just bundling in a couple of bug fixes and improvements. Developer Guilherme Rambo‏ thinks the root of the problem is that the latest builds of iOS 12 thought they were about to expire for some reason. This led them to tell people to update to the latest version, even though there wasn’t a new one available at the time. This isn’t the first time Apple’s had some trouble with beta software. It pulled the iOS 12 beta 7 because it was freezing iPhones and replaced it immediately with the beta 8 build. The official version will be rolling out later this month.